Changing Tax by SKU – Pacific Amber Technologies Inc.
You can setup which tax's apply specifically to which SKUs to include or exclude particular SKUs from one or more of your tax options. 1. Login to the system, and then access the Setup menu. Step 1: Select the Stores tab. Step 2: Select the Store that contains the SKUs. Step 3: Select the General tab in the bottom half of the screen. Step 4: Select the More option to select tax's by SKU. 3. Select the Sku Taxable option. Step 1: On the left-hand side you can individually select which SKUs the tax will be applied to by simply clicking the checkbox beside the corresponding SKU. 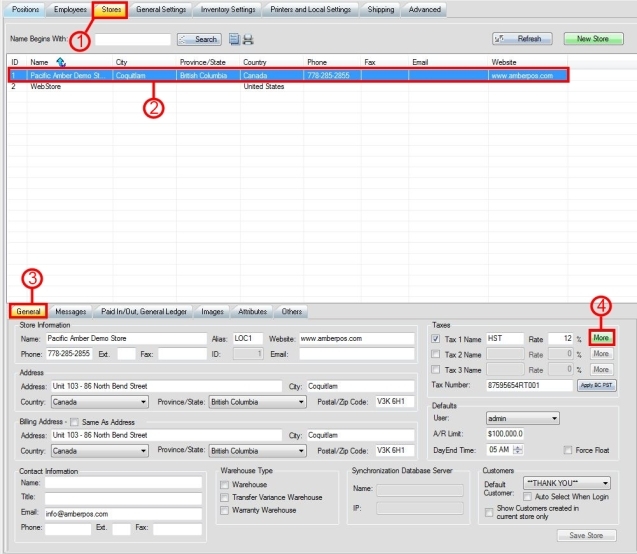 Step 2: The Select All, Check Selected, and Uncheck Selected options will allow you to first click and drag your mouse to select multiple SKUs at once and then select those SKUs in multiple quantities at once using the given options. Step 3: Select Save to complete the changes made for tax by SKUs.